Hairy-chested sports cars. I never fully comprehended that phrase, but many a journalist has claimed that this was the last of them. All I know is that the TR6 was the last of the true TR line. Later cars were no longer built on a separate chassis and they had little in common with their predecessors. 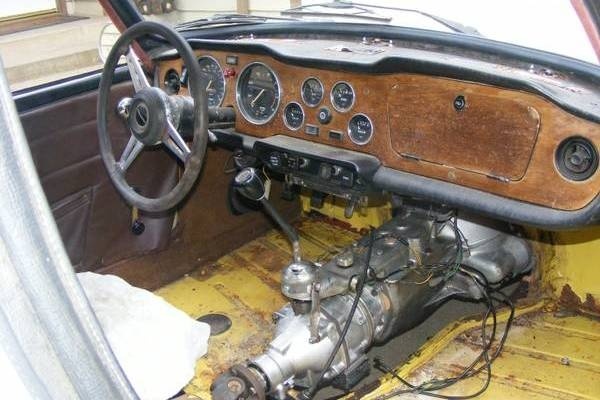 The seller of this particular TR6 claims that it currently runs and drives. There are a few other issues that need addressing, but they are only asking $3,200 on Seattle’s craigslist. 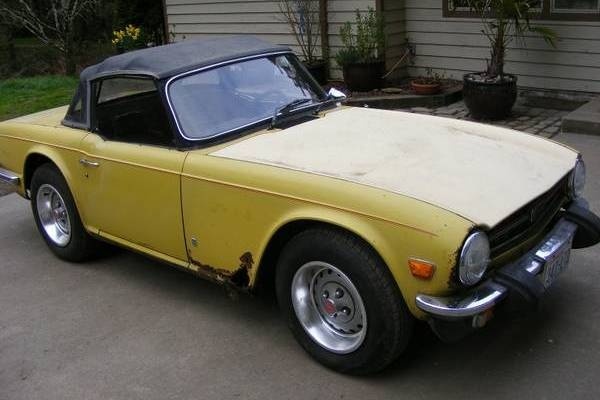 The TR6 was essentially a rebodied TR5, which was a rebodied TR4, which was… You get the point. It all started with Triumph’s first attempt at a sports car, the TR1. They wanted a piece of the pie that they saw MG enjoying, but their first attempt wasn’t too desirable. After making some changes they released the TR2 and had a hit on their hands. Then they made a few more changes and released the TR3. They may not have handled as good as other cars, but they sold quite a few. Truimph continued to improve on their basic formula. Power increased a bit and the exterior was given a new suit. That brings us to the TR6. It may not look like its older brothers, but they had much in common. Unfortunately, the ones that made it to our shores were not as hairy-chested as the European versions. Emission standards choked the engines and bulky bumper guards tarnished their English good looks. Still we wouldn’t mind having one. 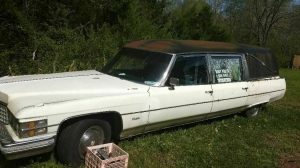 The seller mentions that this car has rust, but that it is mostly on the exterior. I supposed that is a good thing, because the rust we can see looks bad. They claim that the floors are solid, so we are hopeful that the frame is too. If it is, then perhaps you could drive it while restoring the repairing the sheet metal. You had better be handy with a welder though. It is going to need an interior before driving too far, but kits are cheap and easy to get for these British roadsters. We do respect the seller for getting the car running instead of parking it out back because of a little rust. Now we will just have to see if the next owner has enough hair on his chest to keep it on the road. ….sounds to me like the seller’s TRying his best to be TRuthful…. A TR6 is about the cheapest way to get into a vintage convertible with a smooth multi-cylinder engine and attractive Italian styling. They look good, sound wonderful, are plentiful, and are cheap to buy. 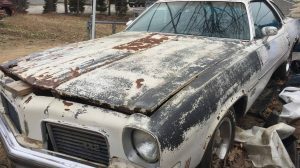 This one seems to have had a lot of work done, but…..there’s always a but….it’s in the rainy Pacific Northwest and has rust that’s claimed to be only on the exterior. 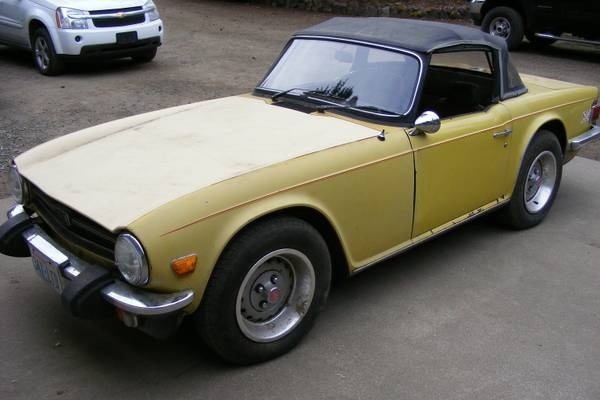 I have checked a few TR6s for possible purchase that had bodies that looked better than this one, but had fenders that needed replacing when you look underneath. I would bet that the RF fender on this car needs replacing, at a minimum. The fenders bolt on, so that’s not a disaster, but the car will need a complete paint job when it’s done, and it’s only reasonable to factor in much more work to get it ready for paint. Then there are the rear trailing arm pivots, which are often terminally rusty and dangerous….and the seller doesn’t say what the mileage is so you have to worry about worn bearings/crankshaft end play in the engine,…and…. Better to spend a bit more now for the best car you can find than go for the cheapest car. There are a lot of TR6s out there. I would spend $7 to $9K for the best driver I could find instead. Even cheaper is a Spitfire. This looks like a good starting point for a toy, a project, but as Dolphin writes check for rust at all suspension points to chassis. I had a 59 TR3 and a 63 TR4, both purchased second hand so when I got a few bucks togther I decided I would purchase the new TR6 that had just come out. Now with the two previous models I had taken out the seats and moved the rails back 3″ because I am about 6’5″ and it was the only way I could get in and drive them. Plan was to do the same on the 6, But when I got in it I found the seat back was already against the rear wheel well and there was nowhere to go. So I bought a Fiat 124 Spyder instead and became intimately aquainted with my new mechanic Gio. After that it was a firebird formula 400 with all the pollution controls removed. Best ot the lot but not a convert. 6’5″ & you got into a 124? I’M 6FT4IN AND MY FIRST CAR WAS A 69 MG MIDGET.GETTING IN WAS HARD BUT ONCE IN I HAD PLENTY OF LEG ROOM AND A LITTLE HEAD ROOM. GETTING OUT WAS JUST A MATTER OF ROLLING OUT.I EVEN GOT LUCKY IN THE LITTLE THING. KMAN, I TOO WENT FROM MG TO FIAT WITH A COUPLE X19’S AND SPYDERS, GREAT FUN CARS EXCEPT FOR THE ELECTRICAL SYSTEMS.FROM THE FIATS I WENT TO A 68 MUSTANG CONVERTIBLE THEN WAS SWAYED FOREVER WHEN I BOUGHT MY FIRST 74 CORVETTE. I DID THE SAME WITH BIKES GOING FROM TRIUMPH TO YAMAHA THEN TO THE ONE AND ONLY HARLEY.NOW I’M AN ALL AMERICAN GUY. You’re wasting your keystrokes on old Fred..everyone tells him the same thing, but he’s just too old to get the idea of posting etiquette. Just ignore his comments.. 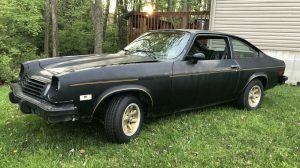 I can almost guarantee this will need new rocker panels as well, but luckily everything you need for this car is readily available via the aftermarket so. Price-wise it doesn’t look so bad. Drive it while you restore. By the way, good luck to anyone looking for a TR1 – I don’t think they produced it. It was shown at a Motor Show (around 1950? ), and from the comments they received they started with the TR2. The forerunner (but really not a sports car) was the Triumph Roadster, the 1800 in 1946 then the 2000, of which I had a 1949 version. I could “shoot the breeze” about that car for a long time, loved it, and it had dickey seats (rumble seats). Alan,You’re right, there was a showcar displayed in 1950 called “The Triumph Roadster” on the brochure, with the (internal?) designation TRX. It was very advanced-looking for the day….very rounded and ‘streamlined’ looking. I believe they made 3 of them and that it never went into production. I have never heard of it being called a TR1. You can see brochures for the TRX offered on eBay occasionally. I really like the TR6. 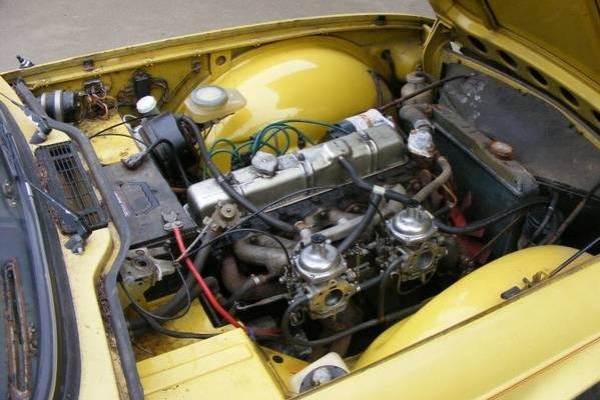 Seems that having a six under the hood holds a little more charm when you’ve been scooting around in MGB’s, etc. 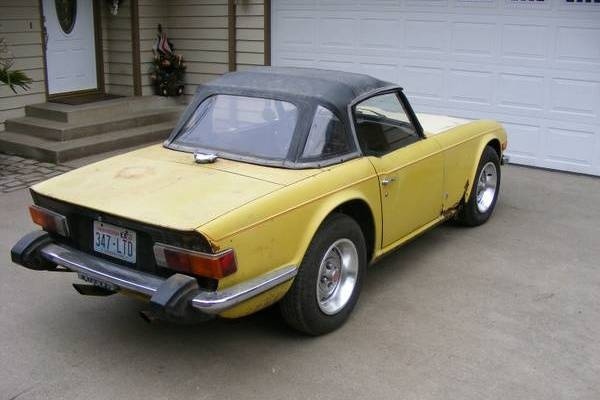 I think the TR6 will ultimately be a good collector car some day… but I guess there are a lot of them around. This one is cheap entry, and drive as you restore, but ultimately, Dolphin is right on…if you can afford a few grand more, do it and get the best.. you’ll spend the money either way, its just a matter of timing. 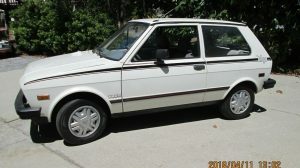 In SoCal one in very good condition can be had in the low to mid teens………with no rust. So once you do the math…………I’m out. I think I heard somewhere years ago that the MG crowd was more polished and urban while the Triumph owners were more gearhead or in UK speak “Petrol-Heads”thus the hairy chested comment. I had a TR3-A and I thought it handled as well as my MG. It did have a solid rear axle but the rear end didn’t go leaping about in hard cornering. Triumphs always had strong power curve unlike the MGs which needed the higher RPMs to get moving. As a former TR-6 as well as British car shop owner I would also suggest checking the differential mounts as they had a major tendency to crack because of the torque created when the driver would “dump the clutch” too often. Almost every TR that came into my shop had this issue or had it already repaired by welding and boxing the mounts. This required removal of the differential unit. Also, take a good look at the front valence below the bumper, it may be practically gone from rust! I had a friend who had a GT6, Spitfire with a roof & a 6 had the same problem with the dif. mounts, donuts & every other place that the additional torque could have an effect. As for me I drove the crap out of my Spit. I would be all over this, but then the MGB, Jensen Healey, MK I Rabbit ad Avanti II would have to squeeze so tight in the driveway that I wouldn’t be able to open the doors..